Las Vegas Aviators President/COO Don Logan named 2018 Pacific Coast League Executive of the Year! LAS VEGAS: The Las Vegas 51s professional baseball team, Triple-A affiliate of the Oakland Athletics, and the Pacific Coast League announced today that Don Logan, 51s President/COO, was named the 2018 PCL Executive of the Year. The executive of the year award is voted on annually by the league's 16-member clubs and awarded to the PCL's top club executive. Logan also becomes the first "three-time" winner of this award in PCL history. He received the executive of the year award in 1992 and 1998. Don recently completed his 35th season with the Las Vegas professional baseball franchise. He has been a part of Las Vegas' two championship teams, which captured the PCL title in 1986 and 1988. "This award is truly deserved as Don is a huge contributor to the success not just of the 51s but also that of the PCL," PCL President Branch B. Rickey said. "Executives across our league value his instincts and unique insights. He is a catalyst for dynamic thinking everywhere he is involved in the challenges of sports business." Logan also received the Larry MacPhail Promotional Trophy in 1991 and 1997. He also serves as the PCL's Vice-President and Joint Minor League Baseball Marketing Committee. He is chairman of the league's executive committee that oversees the operation of the PCL and that serves as the advisory board for Branch Rickey III. 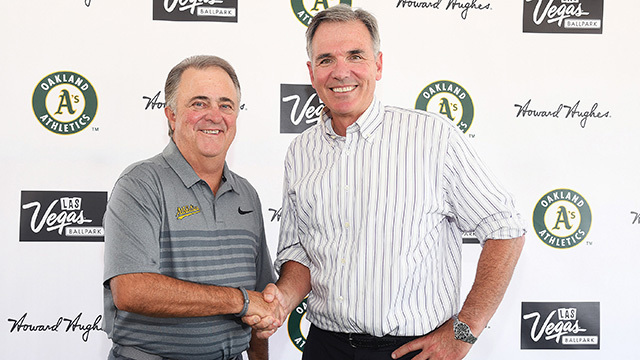 Logan, in conjunction with, The Howard Hughes Corporation®, secured the naming rights deal to build a new state-of-the-art Triple-A baseball stadium in October 2017, that will begin a new era for Las Vegas professional baseball in Southern Nevada. Logan has worked on this stadium project for two decades. Las Vegas Ballpark, a 10,000-fan capacity baseball stadium currently being built on eight acres of land in Downtown Summerlin®, is scheduled to be completed in March 2019. He was recently presented with the Free Enterprise Award by the Las Vegas Metro Chamber of Commerce (Dec. 3). The award is given to those who personify the entrepreneurial spirit and commitment to free enterprise in Southern Nevada and across the entire state. Logan's other honors include: recipient of the 2007 Chin's Humanitarian of the Year for the Muscular Dystrophy Association of Southern Nevada; 2010 ESPN Sportsman of the Year, that benefit The Caring Place, a local nonprofit organization dedicated to easing the journey of those affected by cancer; inducted into the Southern Nevada Sports Hall of Fame (2011); 2018 Nevada Broadcasters Association and Foundation Community Achievement Award. The 51s will open their 37th season in the Silver State on Thursday, April 4 against the El Paso Chihuahuas, Triple-A affiliate of the San Diego Padres, at Southwest University Park in El Paso, Texas. The 51s will open the new Las Vegas Ballpark (10,000) on Tuesday, April 9 against the Sacramento River Cats, Triple-A affiliate of the San Francisco Giants, at 7:05 p.m.
Full season tickets and mini-plan packages (18 and 35-game plans) are available by calling the Las Vegas Ballpark Sales Center at (702) 943-7200. Official licensed team merchandise is available on the "Team Shop" section of the website.